Why does maverick spend occur? Recently, we co-hosted a webinar with Institute for Supply Management (ISM), and it was full of great insights! ISM’s Managing Director of Global Operations, Lane Burkitt, chatted with our Chief Strategy Officer, Steve Griffiths, about how technology is solving one of the biggest challenges that procurement organizations deal with: maverick spend. 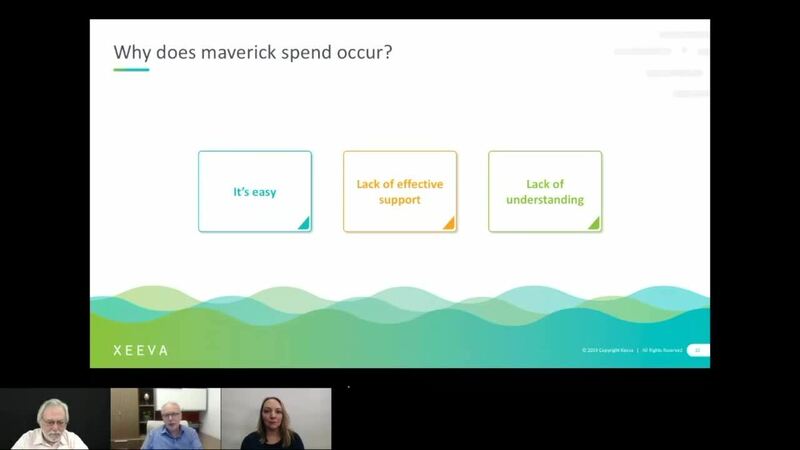 What are some of the underlying causes of, or reasons for, maverick spend? LANE: Well, sometimes it’s the easiest way to solve a problem, right? Sometimes, the processes that we have in place, because we’re using old technology or because we have systems that don’t talk well with each other, it’s much more expedient; it’s easier, and we’re all busy. We’re all out there doing our job every day, and buying shouldn’t take a huge amount of our time and effort. And so sometimes, it’s easier to take your p-card, call somebody up, and just get what you need, rather than going into a system trying to remember your login, and – oh yeah – this system only uses that part number in this configuration, but that’s not actually in that database. So, I have to find it in another database, copy it and paste it over into here in order to go and buy – I could have already had the product in my hand if I went down to the store, right? And so, we need to make sure that technology enables, rather than getting in the way of the proper policy and contract spend. The other thing, sometimes people don’t understand the impact that it has. When I was talking about the operations managers who were actually creating the PO after they receive product, they were just trying to make sure that the PO that they created was accurate, right? Because if the PO quantity didn’t match the delivery quantity, then there was a dispute process and it had to go through a whole ‘nother process, and their supplier didn’t get paid. And so, their way to make sure it was accurate was to create the PO after they received the stuff, then they always knew it was going to be correct. But they didn’t understand that’s not compliant – it’s not good policy or good practice, and you’re never going to get on top of and get control of your spend working that way. STEVE: I think, sometimes it’s not even the local people trying to just take the easy way out. Sometimes it actually has to do with a lack of effective support. I’ve got a purchasing system in place, I put in contracts or catalogs, but the catalog maintenance function is not effectively managing the price renewal dates. And so, what appears to be maverick spend is actually driven by the failure to actually keep the catalog pricing current. Or sometimes, it’ll be corporate’s lack of understanding of what’s actually happening in the plant. And that’s where getting in and analyzing your maverick spend can really point out some interesting insights and get to the root causes. We were working with a company recently that expended a huge amount of money to create contracts across most of their MRO spend in the plants. Yet when you looked at this spend and compliance to those contracts at a couple of plants, they weren’t compliant at all. And the first question is “Why? What’s going on with these people?” And the reality was, once you got down to the plants and you understood what was going on, their incentives were on spot buy savings, on purchase price variance. So, if they complied with the contract, they wouldn’t get any PPV savings, and therefore, their incentives were totally out of line with what corporate was trying to do. And that just meant changing what the incentive structure looked like and starting to measure on-contract spend as opposed to PPV. For more on maverick spend (and how advanced technology can help solve it), check out the full webinar!